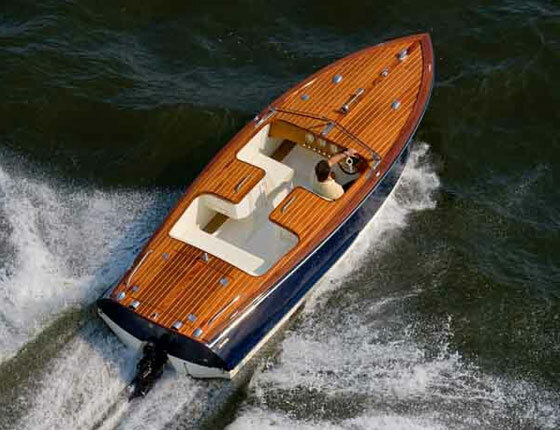 Retro styling, real mahogany, and an Italian pedigree make the Cherubini as much art as boat. The top names in exotic motor vehicles—Ferrari, Lamborghini, Ducati—all share one thing in common: an Italian design that mixes gripping styling with shocking performance. 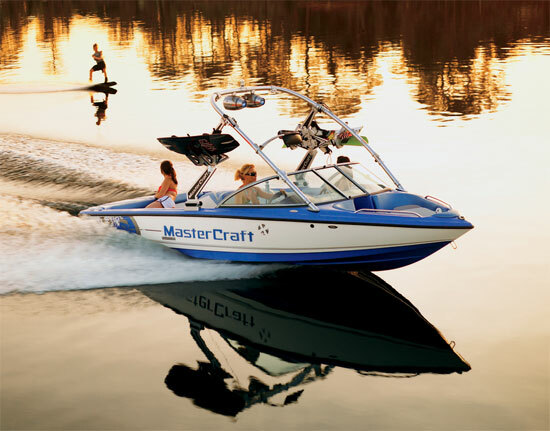 When it comes to boats, however, most of us think Americans rule the roost with names like Fountain, Skater, and Adrenaline. Then you see a Cherubini Classic 20, and realize that those pasta-loving people from a boot-shaped country just can’t be topped when it comes to combining eye-appeal and high-octane horsepower. The Cherubini 20 combines classic lines and craftsmanship with a modern Mercury powerplant and jet drive. The Cherubini soothes your eyeballs with mahogany decks and trimmings, polished to a glow through a month-long process of long-board sanding and 10 separate roll-and-tip applications of varnish. 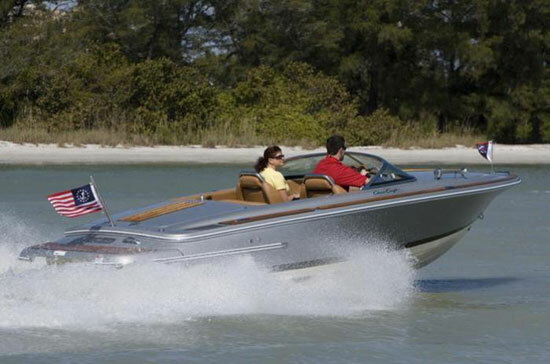 The mahogany is real planking—not a veneer—and it makes the wood finish on most modern powerboats look as fake as a ten dollar Rolex. Probe into the Cherubini family’s history and this kind of craftsmanship seems natural; Luigi Cherubini was an Italian composer said to be a favorite of Beethoven, and his descendents include a long list of world-famous piano builders, sculptors, and yes, boatbuilders. Hidden beneath the sculpted exterior lies a 250-hp Mercury Optimax two-stroke coupled to a jet drive (stern-drive models are also available), which blasts this little cherub to a 52.1-mph top end. 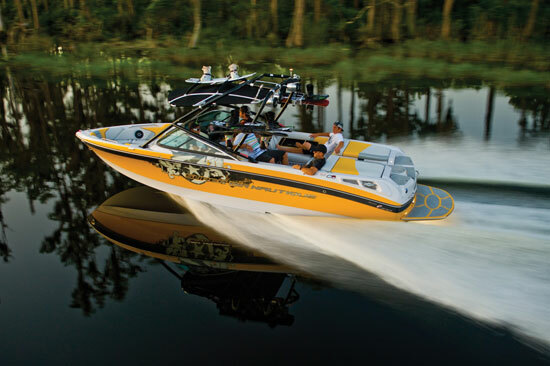 Though any speed over 50 is impressive for a boat this small, it certainly isn’t record-breaking; the real performance highlight of this boat is the handling. 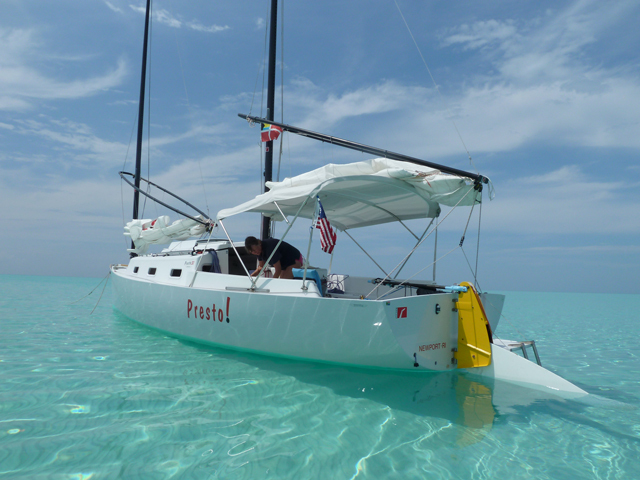 The finely-tuned steering system takes you lock-to-lock from full port to full starboard with a half-turn in either direction, allowing you to make 90-degree changes of direction with a mere twitch of the wheel. Put it hard-over, and the boat spins like a ballerina. Italian craftsmen lay 10 coats of varnish on real mahogany planking. Push-pull switches and analog gauges maintain a decidedly non-digital look. Ready for some real fun? 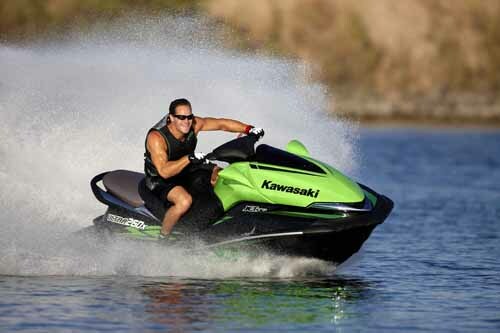 Punch the throttle, then smash down the single-lever control and throw the boat into reverse. With the jet drive you don’t have to worry about blasting the transmission to smithereens, and it essentially allows you to throw on the brakes. On the Cherubini I tested, however, you might also want to throw on the earmuffs. The Opti created a brain-numbing 110-dBA, which is about as loud as a car horn when you’re standing in front of an open hood. Fortunately, this problem can be addressed with the addition of an optional muffler. The Cherubini’s looks and performance are backed up by relatively standard but beefy modern boatbuilding construction techniques. The hull is solid glass stiffened with glass stringers; bulkheads are tabbed in with fiberglass cloth, and the hull-to-deck joint is tied together with both mechanical fasteners and 3M 5200 adhesive/sealant. 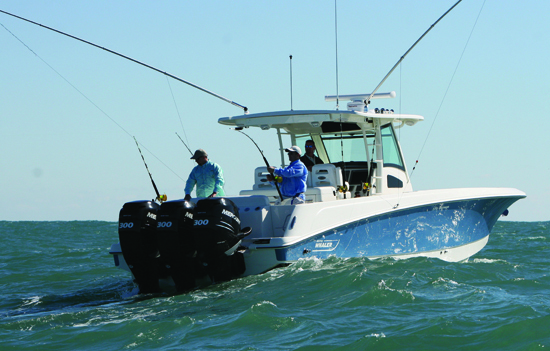 Hardware is spectacular, and even items that are commonly plastic or aluminum on most boats, like the windshield supports and light fixtures, are polished stainless-steel. All that stainless matches the woodwork and retro styling, which also rules in the cockpit and at the helm. 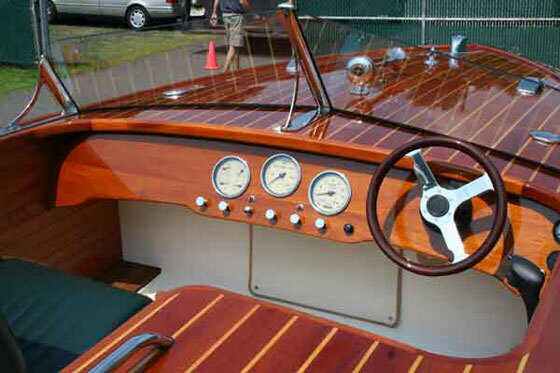 Inside this boat you’ll find analog gauges and push-pull switches, not digital displays or lighted rocker switches. Naturally, the factory can install these contemporary controls—if you force these artists to put function before form, you vulgar Barbarian. But in that case, I wouldn’t expect them to give you the complimentary Luigi Cherubini music CD that usually comes with this high-style, high-octane, highly exotic motor vehicle. 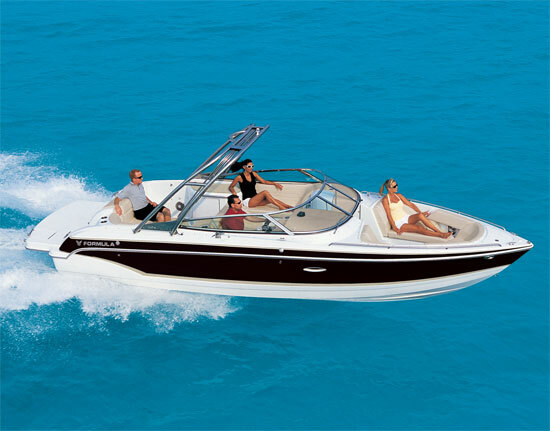 Comparison shoppers may want to look at the Saetta LE, Crest Craft 25, and Hacker Craft Runabout. For more information, visit Cherubini Yachts.